Miss Helen Knox informs Martha Berry of a search for the twelve greatest women of America being conducted by "Good Housekeeping." Knox advocates for Berry to submit her influential vote for Percy V. Pennybacker. 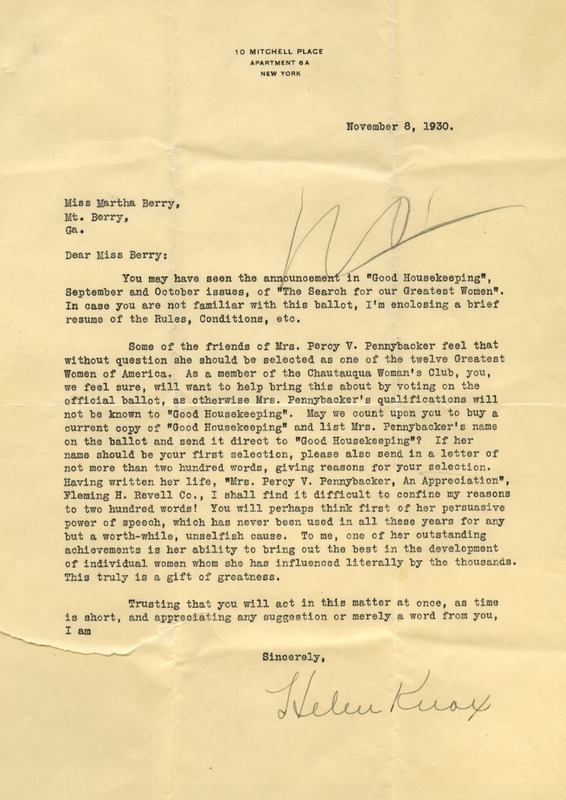 Helen Knox, “Letter to Martha Berry from Helen Knox.” Martha Berry Digital Archive. Eds. Schlitz, Stephanie A., Jordan Brannen, Daniel Warner, et al. Mount Berry: Berry College, 2013. accessed April 20, 2019, https://mbda.berry.edu/items/show/13106.